When I was pregnant with my third child, I got together with friends to form a babysitting co-op. There were a lot of tasks such as grocery shopping, going to to the doctor, going to the laundromat, and exercising--that were difficult to do while pregnant with two other little kids, so this co-op was a lifesaver for me! Other moms who had older children and wanted to be able to volunteer in their kids' classrooms were able to because they had the babysitting co-op to help provide daytime babysitters for younger kids. In case anyone else has considered setting up a babysitting co-op, I wanted to share with you some of the rules we set up for our coop, as well as offer some free printable documents I created for using within our co-op. When I was organizing the babysitting co-op, I distributed this Q & A to several of my friends who were Moms and asked them if they would be interested in joining me in creating a babysitting co-op. Q. What is a babysitting co-op? A. A babysitting co-op is a group of moms who arrange in a formal way to be available for babysitting trading. Q. Why would I want to join the babysitting co-op? A. You might have a doctor appointment or errand to run during the day when it is inconvenient to take kids along, or you might just need a short break! During the school year most girls who are of babysitting age are in school. But sometimes it's hard to ask favors of other moms. The co-op allows us to do favors for each other in a more formal way. Q. Does this mean I can never ask for help babysitting outside of co-op? A. No. You can always ask your friends for help when you are in need. But sometimes if it is something that is not urgent or just for fun it is easier to use a babysitting co-op without feeling guilty. Q. What would be my responsibilities as a member of the co-op? A. Simply choose a 3-hour block of time once a week in which you would be willing to stay home and be available to babysit if anyone needs. Choose a time when you would be staying around the house anyway. People would drop their kids off at your house and "pay" you with fake babysitting co-op money. You can then turn around and use that money to "pay" others to babysit on their co-op days. Q. When do I have the right to say "no" to someone who asks me to babysit during my assigned co-op time? A. You need to know your limits as an individual. If you have a lot high-demand children you are already watching, you can say no to those who RSVP too late. If you have a small apartment, you can set a limit on how many children you will babysit. But if you feel comfortable, you can say yes to everyone. The more you babysit, the more "dollars" you earn, and the more you can take advantage of the co-op. Q. What are some of the guidelines for the co-op? 1. You must RSVP in advance with the person who is in charge of the co-op that day. If that person already has too many children who have RSVP'd they have the discretion to say no. 3. If 15 minutes of your assigned co-op start time has elapsed and no one has RSVP'd you are no longer obligated to stay home and be available that day. There may be days when you don't have to do any babysitting. But you can still stay around your house and wait for potential kids just in case. 4. In order to keep the babysitting trading fair, we will exchange fake money. We will all start out with a predetermined amount of co-op money. You will pay $1 of fake co-op money per hour per child. Once you have run out of your initial money, you can't take advantage of the co-op babysitting unless you have provided babysitting in return and "earned" money. This prevents people from using all the babysitting without paying back by babysitting. Below are the "tickets" we used to keep track of babysitting credits. I created both one hour tickets and half hour tickets. I printed each type of ticket on a different color of cardstock to make them easy to distinguish from one another. 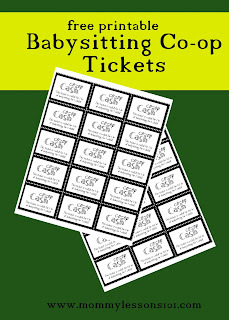 You could print out new tickets each year with a different color of cardstock or you could just be sure to collect all of the tickets at the end of the year to redistribute the following year. We started out each year with 15 hours of tickets per parent (10 one hour tickets and 10 half hour tickets). 2. If it is the morning of your scheduled shift and nobody has called to reserve spots for their children, you’re off the hook. 3. Limit of six (6) children to be watched by sitter (including your own children) during day shifts. (An individual sitter may decide to watch fewer if she’s uncomfortable with these numbers, but please don’t watch more than these numbers.) Up to eight (8) children may be watched if your spouse is available to help out. 4. One ticket per hour, per child. 5. Only children of co-op participants can be dropped off. 6. Babysitting can only be done by the co-op member. 7. Sitter must keep the children in her own home and yard unless previously agreed upon by parents and sitter. 8. You must drop-off and pick-up during co-op hours unless previously arranged. 9. If you are late picking up your child, you must pay double tickets for any time you’ve gone over. 10. Pull-ups must be provided if you’re dropping off any children who are being potty-trained. 11. One snack should be provided by sitter during the co-op time. (Please refer to the personal information sheet for any food allergies a child might have). 12. If you become unable to fulfill your scheduled shift, you must find another co-op member to replace you for that shift. All co-op mothers must be notified of the change by email. 13. You must use the co-op to make it work and keep the tickets circulating. 14. If you choose to leave the co-op, you must return 15 hours of tickets. 16. Feel free to email other co-op members if you need a babysitter during a non-co-op time to see if someone is interested in earning some extra tickets. I also had the parents contact me with their top choices for three-hour blocks of time in which they wanted to be in charge of babysitting. 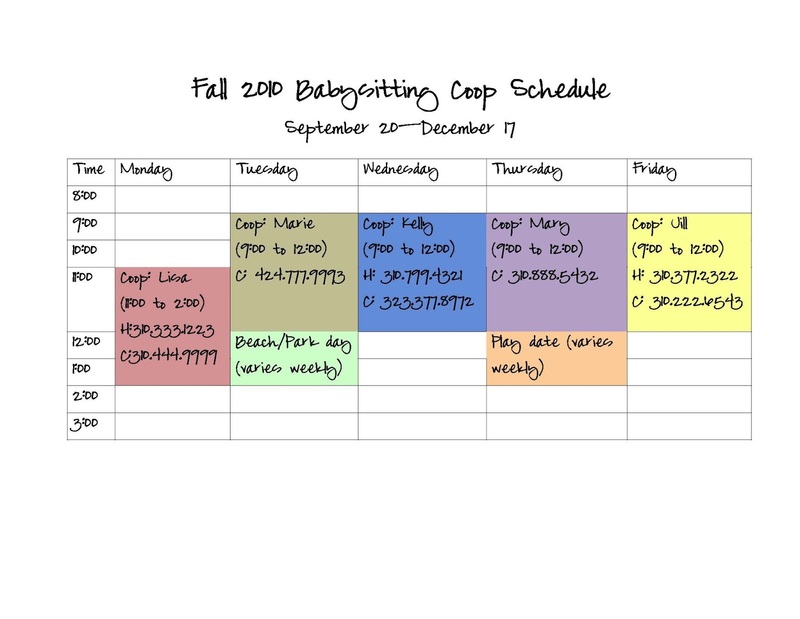 After looking through everyone's wishes and consulting with everyone about their schedules, I came up with a co-op calendar. Here is a sample co-op calendar from our first year (I have changed the names and phone numbers for anonymity). A babysitting co-op works best if you have at least five moms so each mom can take one morning a week. It can also be done with up to ten moms, having one mom in the morning and one mom in the afternoon each week day or having each mom take a day every other week. I found that people prefer to use babysitters in the morning. Afternoon schedules are generally crazier with those who have school-age children. Some have had babysitting co-ops with even more than ten moms, but I think 5-10 is just about right. We only had five moms to start with, and it still worked fine. After I created the calendar and collected information from all of the moms, I distributed this calendar and along with a document with all of the information that I had gathered from each parent about themselves and their children to each babysitting co-op member. Fortunately, we all already knew each other from our playgroup, but if that is not the case for your group, I would suggest having a meeting at a park or someone's house to get to know each other and make sure you are all comfortable with dropping of your kids for babysitting at each other's houses. 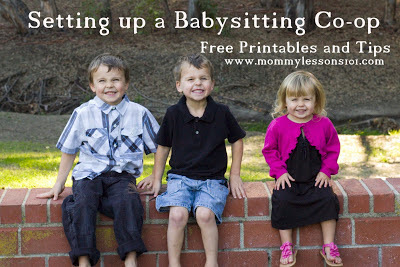 If you can get it all organized, a babysitting co-op can be a life saver!